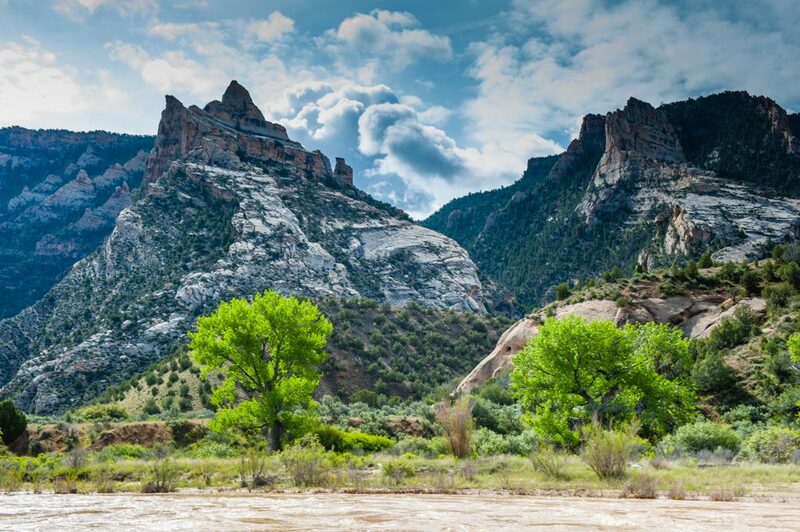 JOIN Southwest Seminars, Dr. Kirt Kempter and Dr. John Ware for a geologic and archaeological journey on the scenic Yampa and Green Rivers through Dinosaur National Monument. This 7-day, 7-night trip begins with a welcome dinner the first evening followed by a land-based day exploring famous Fremont culture rock art panels and the renowned National Monument Dinosaur Quarry and nearby archaeological rock shelter site. Our trip highlight is five days rafting through 71 miles of vividly colored canyons while exploring prehistoric remote archaeological sites and 4 nights camping under the stars. We return to Vernal for a farewell dinner and one last overnight. The trip includes all lodging, meals, river and rafting arrangements and quality time with John and Kirt. The Yampa and Green rivers in northern Utah have carved significant canyons, presenting world-class exposures of Paleozoic and Mesozoic rocks of the spectacular Colorado Plateau. This rafting expedition provides a perfect outdoor classroom for observing various rock strata while interpreting their geologic significance. Each layer of strata tells a story of landscape evolution, including ancient oceans, rivers, and vast deserts. 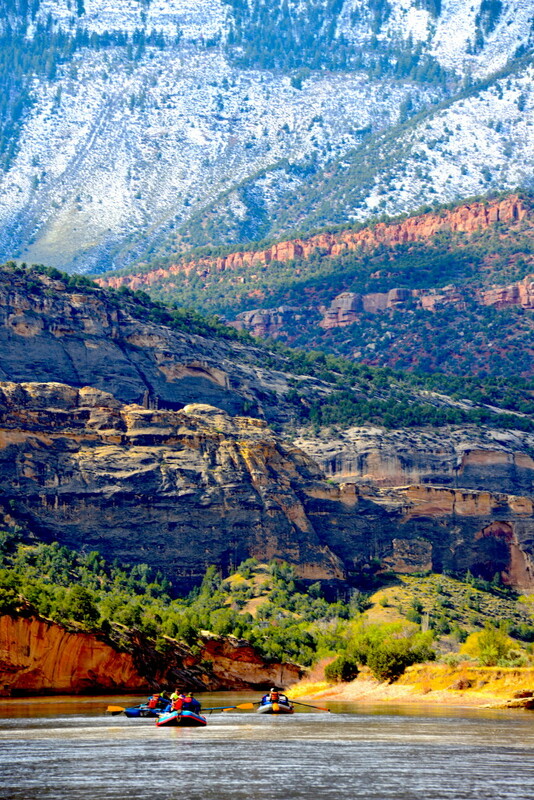 These diverse geologic environments have all had their time on the Colorado Plateau. We observe the clues left behind in each strata that provide their own interpretation and story. Each sedimentary layer contains a record of fossil plant and animal life, providing a record of evolution through time as well as changing climatic environments. 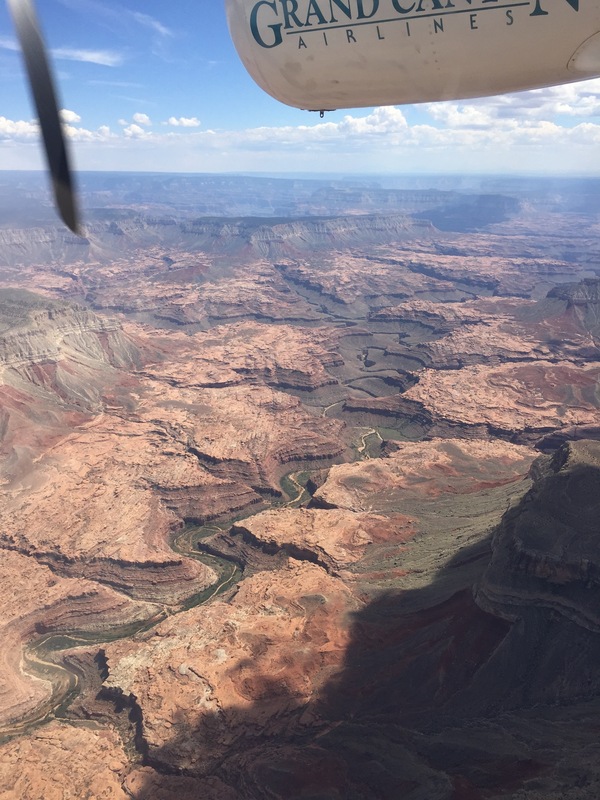 On our journey through the Yampa and Green river canyons we will also witness geologic structures, such as anticlines, monoclines, faults and folds that provide clues as to the history of uplift of the Colorado Plateau as well as the timing of uplift events. We discuss theories involving plate tectonics that help us interpret the cause and nature of the uplift. Lastly, we will explore the geologic history of the Yampa and Green rivers, addressing questions such as: How long have these rivers existed? Where did they flow in the geologic past? 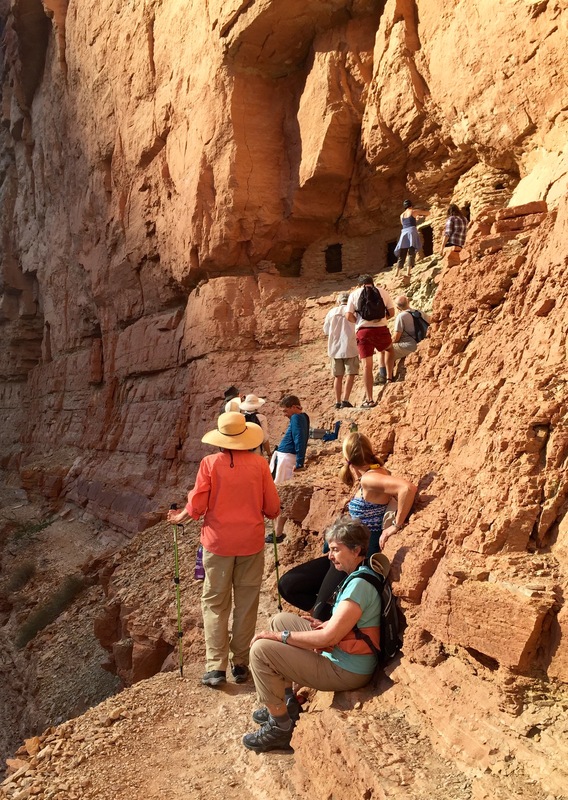 How and when did they begin carving canyons into the Colorado Plateau? DR KIRT KEMPTER is a Fulbright Fellow and holds his doctorate from University of Texas-Austin. He is a popular world-traveling vulcanologist and independent field geologist. He is much in demand as a study leader for organizations such as National Geographic, Smithsonian Journeys and Southwest Seminars. He worked for the New Mexico STATEMAP program studying the geologic history of Northern New Mexico and was an instructor for the NASA astronaut-training program. Kirt is the author of numerous maps/articles on geology of the Southwest and is an excellent fajita chef. JOHN WARE is a distinguished Southwest archaeologist and social anthropologist. The author of A Pueblo Social History: Kinship, Sodality, and Community in the Northern Southwest (SAR Press, 2014), Ware was the founding director of Santa Fe’s Museum of Indian Arts and Culture and served fourteen years as Executive Director of the Arizona’s Amerind Foundation, where he sponsored nearly forty advanced seminars and edited over a dozen books on Southwest archaeology, anthropology, and ethnohistory. As a study leader, John has led many tours to Indian Country for Southwest Seminars, the Amerind Foundation, the School for Advanced Research, Crow Canyon Archaeological Center, and the Museum of New Mexico’s Office of Archaeological Studies. TRIP DESCRIPTION: We meet in Vernal, Utah on May 28. 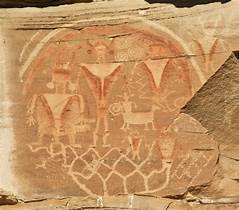 The following morning we visit the Dry Fork Creek Petroglyphs near Vernal, one of the most famous rock art sites in the Southwest. 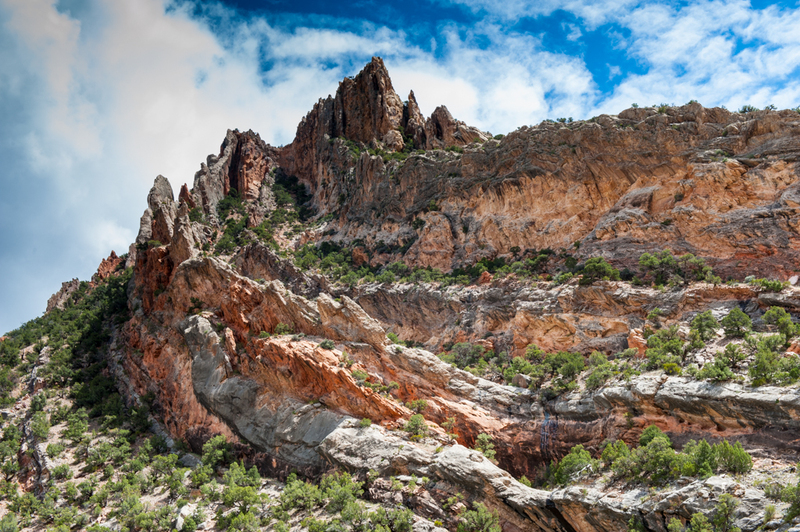 In the afternoon we will explore the Dinosaur National Monument and see fossils of dinosaurs and other creatures that date back nearly 150 million years and visit the Swelter Shelter an Archaic/Freemont rock shelter with petroglyphs. In Echo Park we’ll hike to two Fremont petroglyph panels and along the way cool off in Whispering Cave. After rafting past some massive geologic formations, we’ll enter Whirlpool Canyon, also described in Powell’s account, and camp, as he did, at Jones Hole. experience low and medium-level rapids as we go. Set among towering red cliffs and ancient ponderosa pines, we may see a variety of wildlife: deer, eagles and perhaps bighorn sheep along the shoreline if we are lucky. DETAILS: Rafting will be in 18-foot oar boats with 4 guests to a boat. You may kayak for part of the trip if you wish. Our outfitter will be Dinosaur River Expeditions, family owned and locally operated in Vernal Utah and staffed by experienced and knowledgeable river guides that love sharing the beauty, history and wildlife of the mighty Yampa River of Colorado and the crystal clear waters of Utah’s Green River below the Flaming Gorge. Our guides double as excellent outdoor chefs for our meals along the river. This an active trip that involves hiking, rafting and camping. INCLUDES: This 7-day and 7-night tour includes: Full outfitter services for 5 days of rafting in 18’ rowed boats including 4 nights camping (no charge for the stars). 3 nights lodging at Microtel Wyndham Inn and Suites in Naples/Vernal, Utah (2 nights before the rafting trip and 1 night after). All meals in Vernal and on the river. Study Leader honorarium, all gratuities, all admissions and fee for our services. Sleeping Kit: Sleeping bag, pad & pillow $40 pp. Tents are $20 more. Or bring your own gear. 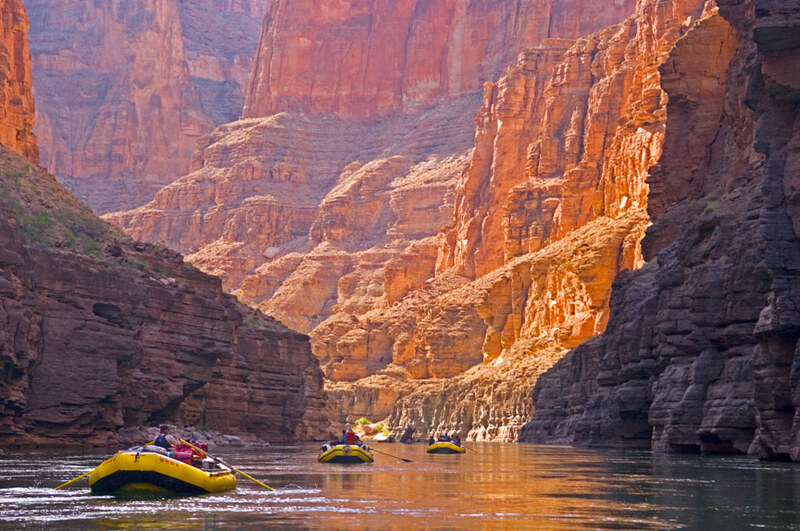 Join Southwest Seminars for the experience of a lifetime led by Geologist Wayne Ranney, author of "Carving Grand Canyon” and social anthropologist, Dr. John Ware and featuring 7-days rafting the Colorado River through the legendary Grand Canyon and 6-nights camping under the stars. We raft into the Canyon beginning at Lee’s Ferry and exit the canyon via scenic helicopter and private charter airplane. The trip includes hotel lodging and dinner the night before the excursion as Wayne and John set the stage for our grand adventure and another night and dinner after the trip wrap-up as we celebrate our amazing journey through the vividly colored Grand Canyon, a 7-day study tour on the most coveted raft trip in the world. Wayne Ranney is a noted and popular Geology Educator and Author, Carving the Grand Canyon and Co-Author, Ancient Landscapes of the Colorado Plateau. He holds an M.A.in geology from Northern Arizona University and has led many tours into the Grand Canyon and the Colorado Plateau region for: Museum of Northern Arizona, Grand Canyon Field Institute and Smithsonian Travel, and Around the World geology study tour with Nat Geo by private jet. Wayne is in great demand as both a public lecturer and study leader, always attracting a packed house at his Southwest Seminars Monday night presentations. His Grand Canyon tours are always sold out so we are delighted and exceptionally fortunate to have Wayne at the helm of our river excursion. Dr. John Ware is a distinguished Southwest archaeologist and social anthropologist. He served as Executive Director; Amerind Foundation and was founding director, NM Museum of Indian Arts and Culture. He is an author, A Pueblo Social History: Kinship, Sodality and Community in the Northern Southwest. As a study leader, John has led many tours throughout Indian Country and has for many years studied the social organization of Eastern Keres Pueblo peoples along the Rio Grande corridor. At Amerind, he sponsored many symposia featuring prominent scholars who gathered on campus to meet and discuss issues in Southwest anthropology, archaeology, and ethno-history while sharing ideas and new research which produced cutting-edge books on research topics. Trip Details: The trip will be in 37 foot motored raft as they are more comfortable and safer for this kind of expedition and the preferred mode for this river excursion by Wayne. The motors are quiet and able to be turned off as opportunities for drifting allow. Our highly recommended outfitter, Colorado River & Trail Expeditions (CRATE) has been in business since 1971 and features knowledgeable, trained and experienced river guides, who are excellent outdoor chefs, enthusiastic river companions and certified in CPR, Wilderness Medicine and River Rescue. The weather is usually pleasant in May. When it is hot, it will make those rapids so much more welcoming. Random thunderstorms might result in amazing waterfalls off the rim or cactus blossoms along our journey. Our trip begins (1st day - August 21) with a welcome dinner and lecture by Wayne Ranney and Dr. John Ware at Cliff Dwellers Lodge in Marble Canyon, Arizona, followed by an orientation about basic logistics on the river. 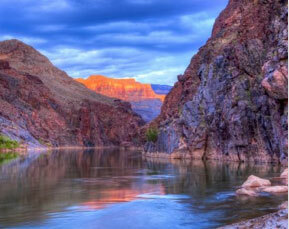 Our put-in is Historic Lee’s Ferry, 13 miles below Glen Canyon Dam. Entering Grand Canyon, within the first few miles we begin our descent though geologic layers traveling 78 miles by river to the bottom of this great stack of rocks. Run Badger, Soap Creek and House Rock rapids. 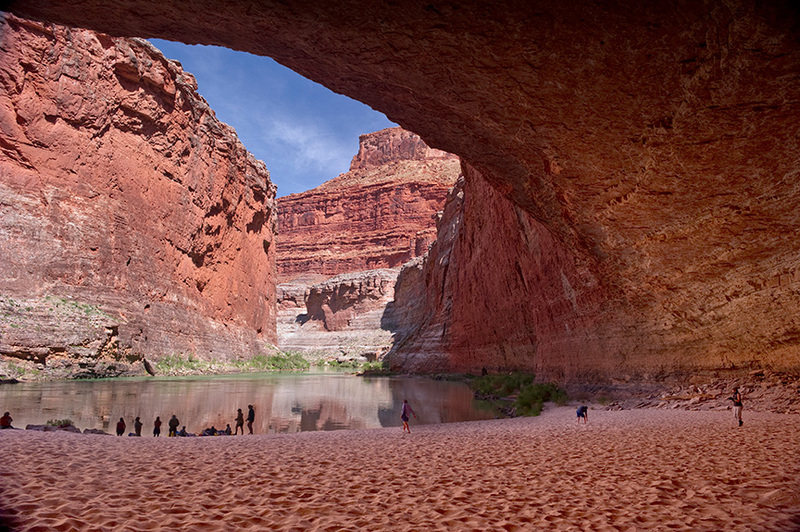 Float deeper into the Marble Canyon section of the river and see lush green spring of Vasey’s Paradise stopping at Redwall Cavern, a vast alcove that J.W. Powell estimated would seat 50,000 people. 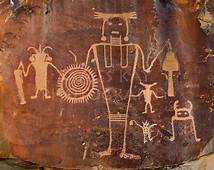 Hike to ancestral Puebloan habitation sites, rock art sites or granaries. Hikes optional (but recommended). 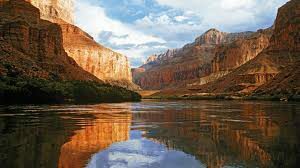 The canyon is truly grand as we float downstream to the turquoise blue waters of the Little Colorado River, the spiritual birthplace of the Hopi Fourth World. The canyon begins to open up as we encounter Tanner, Unkar, Nevills and the formidable Hance Rapid. 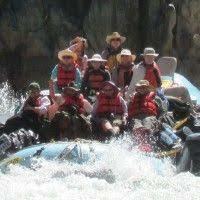 We reach some of the biggest whitewater in the canyon as we enter the Inner Gorge. Make a quick stop at Phantom Ranch, designed by architect Mary E. Jane Coulter in 1922 as a tourist camp, it’s style later adapted to most other National Park Service locations. Enter the Middle Granite Gorge and a series of exciting rapids – 128 Mile , Specter, Bedrock and Dubendorf. Enter the Granite Narrows, the canyon’s narrowest point and visit Deer Creek Falls for a refreshing dip in the clear pool beneath the falls. 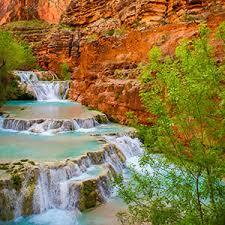 Hike the limestone terraces and the travertine pools and waterfalls of Havasu Canyon. Raft the notorious Lava Falls in the depths of the Grand Canyon near the end of our journey. Includes: 9 days and 8 night tour includes: Full outfitter services for 7 days of rafting in 37’ motorized rafts, 6-nights deluxe camping including cots, foam pad, sleeping bags, chairs, tents (and stars), 2 nights lodging at Cliff Dwellers Lodge,all meals at the lodge and on the river. Helicopter/airplane transfer back to Lee’s Ferry. Study Leader honorarium, river guide gratuities, admission, fee for our services.